As I noted at the beginning of this series of posts about the Duke Lung Transplant program, I have been fortunate enough to know and work with Dr. Lin during my career as a nurse practitioner. But, in all the time we spent rounding and caring for patients at a small community hospital in Virginia, I never scratched the surface of the multi-faceted, and multi-talented Dr. Shu Lin. Like many talented surgeons (Dr. Thomas D’Amico, Dr. Rafael Beltran, Dr. Edgard Gutierrez are just a few other examples), Dr. Lin is a humble and down to earth person. He is quick to shrug off any praise or admiration of his talents. When receiving tearful thanks from a grateful family member of one of his patients after completing a multi-hour lung transplant, he gives a shy smile, and says “it’s no problem” before giving further details of the operation and the expected post-operative recovery. At first glance, you expect this soft-spoken and gentle natured surgeon to be shy and retiring but you quickly learn to appreciate his keen wit and fine-tuned sense of humor. The walls of his office are papered with just a sampling of the numerous awards and recognition he has garnered since childhood, as a concert master for the symphony orchestra (violin, high school), as an avid tennis player, research awards in both the fields of surgery and immunology. More awards undoubtably lay forgotten in a desk drawer somewhere, replaced by photos of his family. Seeing all of this makes me reconsider the Shu Lin I thought I knew, and whom I call a friend. I always knew he was a gifted and talented surgeon (I always call him ‘quietly brilliant’ due to his unassuming nature) but now, even I am overwhelmed by it all. Yet, he remains unaffected; the gracious, caring surgeon I always knew. He looked surprised when I told him that his was the toughest interview I’d ever done; especially since I’d just come from interviewing one of his colleagues. But it’s true – I pride myself at trying to maintain an aura of objectivity, and to present information with a degree of clinical professionalism, but with Dr. Lin, it’s hard. Not because he isn’t a great surgeon, and a great clinician; but because he is. I worry that this previous working relationship colors my writing, but at the same time, it is these very qualities of patience, kindness and empathy coupled with surgical skill and clinical knowledge that are so important for patients to know about, and read about. It’s a little awkward too, I think it’s difficult for Dr. Lin to see me in my new role of interviewer, and it’s the first time I’ve seen him in a year – since I left Virginia to embark as a medical writer in Bogotá, Colombia. But after a few minutes, we settle into our roles as he explains some of the issues in lung transplantation. It helps that he’s a great teacher [to the residents and fellows in cardiothoracic surgery]. “I haven’t updated my profile in a few years, I am no longer researching xenotransplantation” [using organs from other species] he says before we launch into a discussion on the effects of acid reflux on lung tissue and graft survival in patients post-transplant. This is one of the current projects at Duke (with Dr. Davis, and Dr. Mathew Hartwig, whom I hope to interview soon). We review some of the history of lung transplantation, which is ‘still in its infancy’, and discuss the role of continued research to address the problems in transplant surgery; such as graft rejection. He also talks about the need to better delineate lung disease and effective treatment strategies. “Transplantation is always the final option for treatment, after medical therapies fail so it’s important that we know as much as we can about both the diseases and the effectiveness of current therapies.” This is one of the reasons Dr. Lin feels very strongly about the need for patients to participate in research studies – “the more we know, the more we can do to treat them.” This is also important when we discuss the future of lung transplantation. – The development of mechanical devices similar to the newest ambulatory VAD (ventricular assist devices) used in heart failure, to allow patients to use mechanical lungs during daily living. Currently, ambulatory ECMO devices allow patients to walk (with assistance) while receiving therapy, which improves survival and prevents complications related to prolonged hospitalization. Dr. Lin foresees the development of more efficient devices (aka artificial lungs) that would resemble the newest VADs in functionality, and would allow patients to live longer, better quality of life while awaiting lung transplant. – Better medications: the development of a new, better generation of anti-rejection drugs with less side effects than Tacromilus (FK-506), steroids, cyclosporine. – Tissue therapies, gene therapies – to prevent rejection of transplanted tissues,and prolong graft function. Dr. Lin believes that the continuing development of all of these competing and adjuvant therapies will promote future research into lung transplantation, for better quality of life for patients, longevity and better post-transplant outcomes. 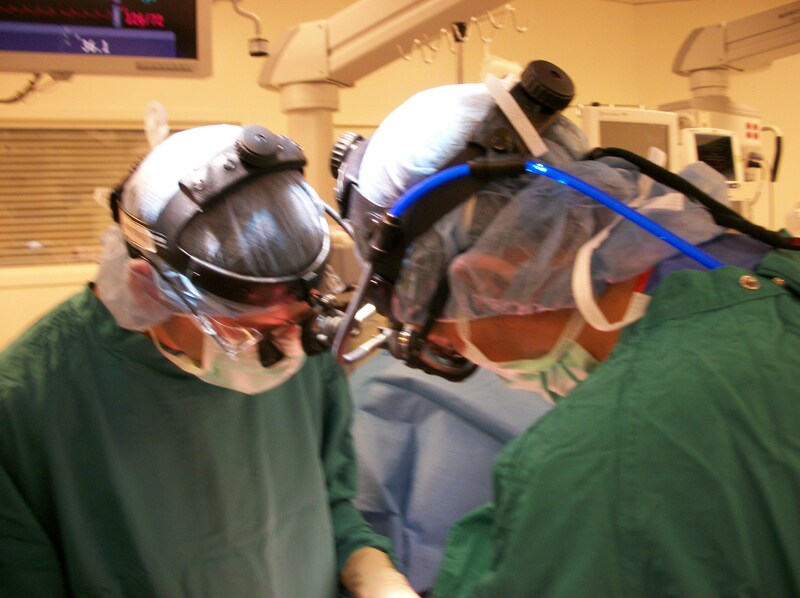 Dr. Lin still maintains an active cardiac surgery practice since by its nature, lung transplant surgery is sporadic. As a busy cardiac surgeon, Dr. Lin performs a full range of cardiac surgery procedures; most commonly coronary artery bypass surgery and valve repair/ replacement. So during my visit, after rounding on his transplant patients, and post-cardiac surgery patients, I observe him performing two bypass surgeries (coronary artery bypass grafting or CABG). This is familiar territory for me – but later, I see him in his role of transplant surgeon during a double lung transplant with Dr. Hartwig. 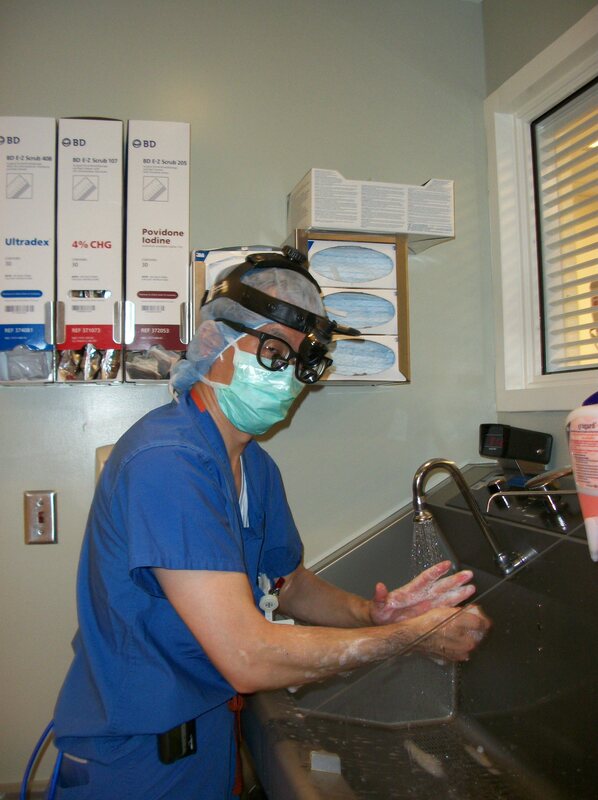 In the operating room, Dr. Lin is deliberate and methodical in his actions, but surprisingly, appears more relaxed*. He tells jokes (clean ones) and stories while working, and appears more comfortable, and unguarded than I am used to seeing. It’s like he left all of the mundane problems of the world outside the operating room door. He works well, in tandem with Dr. Hartwig, who is the newest member of the thoracic surgery department and remains focused but completely aware of his surroundings. This time, I am able to witness the surgery entirely from the recipient’s angle – from the initial clamshell incision, and preparations for the removal of the first lung – to Dr. Reddy’s arrival and lung delivery, and the placement of both lungs to closure of the incisions. This time, when the lungs are first inflated together, after completing the final anastomosis – there is no struggle, the lungs work perfectly. There were concerns when the donor network first called – that maybe one of the lungs had sustained injury, but as per department policy***, in these cases, Dr. Reddy investigates on site, and make the determination whether the lungs are useable after inspection (in telephone consultation with Dr. Lin). The entire surgery takes less time than I expected, and by one am – we are in the waiting room, talking to the family. *** This is one of the reasons Duke has the shortest waiting list time period of any transplant facility in the US. While many facilities reject offered ‘marginal’ appearing organs based on lab values, and the chest x-ray, the surgeons at Duke will often go to inspect the organs before rejecting them outright. As Dr. Davis explained during a separate interview, “sometimes they only give you information about the right or left lung, not both. Maybe the information they give you suggests the lung isn’t perfect, but not terrible either. In these cases, instead of turning the organs down, we would rather take a closer look – so a potentially useable organ doesn’t get wasted. A lot of times, when we actually examine the organs – at least one lung is actually in good condition [suitable for transplant]”. Just one of many of his of grateful patients tells her story. Dr. Shu Lin transplanted my wife at Duke in early April. All I can say is that he is an amazing surgeon and quite a gentle man as well. Nothing but praise and admiration to Dr. Lin and Dr. Haney and all of the medical staff at Duke. I will pass along your sentiments..
Dr. Lin transplanted my husband May 26, 2013. This winter he was ice fishing with our son. That’s wonderful! I am going to pass on your comments to Dr. Lin. Dr. Lin is a hero to our family. He was my daughter-in-law’s transplant surgeon for both of her surgeries. Glad to hear it, and hope you daughter-in-law is doing well. Dr. Lin is an amazing guy and I feel lucky that I had the opportunity to work with him..
Dr. Lin is an agel, who helped my wife get her new lungs in August 2013, now she can enjoy life better. We as a family are obliged, my grand sons also thank him for making their grandma healthy. Dr. Lin performed my double lung transplant July 9, 2013 and changed my life forever! I went from oxygen dependent and barely able to function to running every day and once again enjoying my life!! I am so so thankful every single day for his gift and his amazing spirit! My beloved nephew Jarred McKinley Carter is never forgotten thanks to the heroic medical team that saved US Navy SEAL Lt. Justin Legg (Ret.). A unique legacy for all involved. We can never replace Jarred; but now, nearly five years on we consider Justin family. Thank you to all involved in this modern miracle. After recent double CABG surgery and on a visit from Dr. Lin in recovery, with a tearful joy, I thanked him, not just for saving and extending my life, but for all the thousands of family members he had returned love ones to. This may sound a little mellow dramatic, but true. If I had not awakened from surgery, it would be the family and love ones that suffered. Thanks to Dr Lin and ALL the Duke staff for what they do in extending the lives of many.